All things considered, The Industrial Revolution has had a pretty smooth ride in the history books. This was, after all, a time of empire and all the atrocities that it wrought, a time of labour laws boiling down to ‘Get yer cap on, get to work, and bring yer kids along so long as they’re strong enough to hold a brick’. A productive period then, at least until those grubby workers discovered some fancy new idea called self-determination. But it was also a time of surging upheavals, of impressive tensions between an increasingly cultured society and the black smoke of factories that were fuelling this relentless wave of progress. The chugging machinery of this period almost looked alien, utterly out of place sharing a city with the townhouses, plazas, and pleasure gardens of high society. 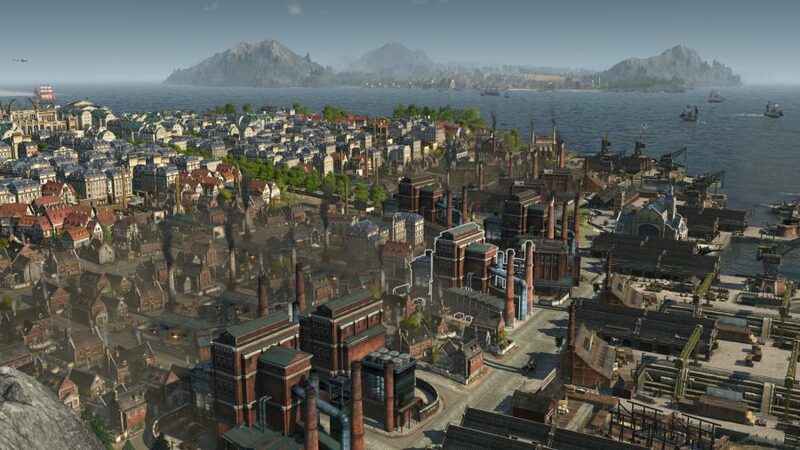 That contrast is what Anno 1800, the latest iteration of Ubisoft’s time-travelling city-builder series, hopes to capture. Stumble through its clumsy interfaces and sometimes inconvenient systems, and you’ll be treated to an idyllic snapshot of this era – a Victorian mood piece that basks in the glory of the era while brushing over some of its more challenging hallmarks. 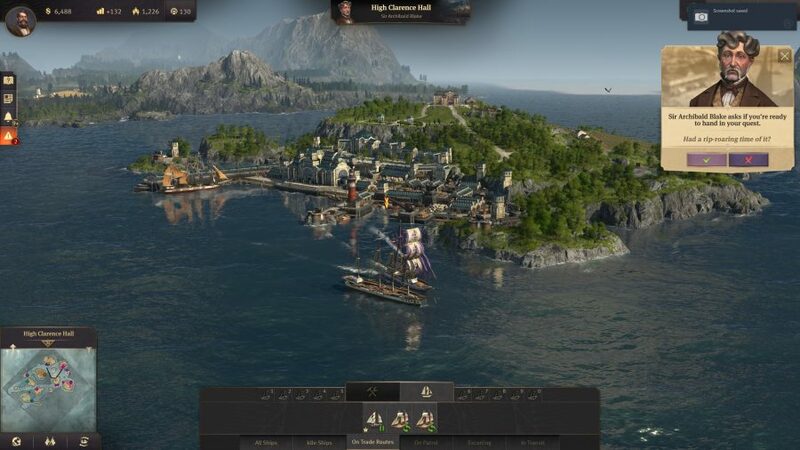 Whether you play the campaign, multiplayer, or sandbox modes, Anno 1800 offers plenty of customisation about how you start your game: whether you want to face insurmountable odds, or build out your empire with few imposed limits, you can. Likewise, you can set one of six victory conditions that range from accruing wealth to attracting investors, or go open-ended. The most important returning series feature is AI enemies. The game pits you against up to three other equally-placed rivals on an archipelago of variously sized islands, with a whole load of ocean all around. Each AI character is well-rounded, with their own personality and behaviours that you’ll need to figure out through diplomacy and by carefully monitoring their movements on the world stage. It’s a welcome return for a feature that should never have been left out in the first place, making games less predictable and rediscovering a sense of competition and personality that was missing in recent Anno outings. The islands can only be owned by one person at any one time. They range in resources and fertility, creating interesting trade route decisions, as well as scrambles to procure the most precious goods. 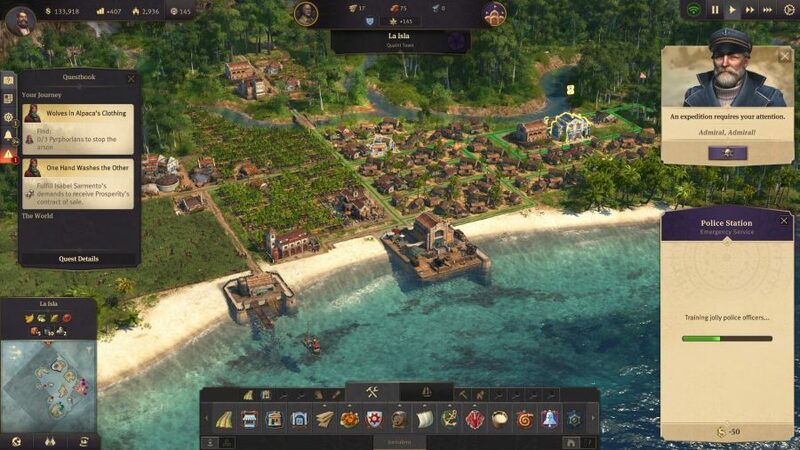 About midway through the game, you’ll unlock the New World too, letting you build colonial-themed settlements in the tropics with their unique resources and buildings. You can then transport goods between the two continents. Typical of this nautically obsessed series, the seas are vital, serving as the stage to trade, embark on expeditions, and take on your rivals in war. But it’s back on land that you’ll be developing that postcard image of 19th-century Victoriana. You do this in several distinct stages that focus on housing. At first, you’re restricted to farmer residences, which allow you to build basic buildings like pubs, warehouses, and farms. Meet the needs of the farmers living there by ensuring a steady supply of food, clothing, and booze, and you can upgrade their homes to worker residences. In turn, these unlock a new tier of buildables like improved paths, and more lucrative and elaborate production chains. You keep at this up to the fifth-tier Investor class in the late game, while retaining the required amount of lower-tier residences to keep all those earlier industries going. It’s a fairly elegant form of progression, even if it’s a sobering reflection of how gentrification actually works; through the blithe clicks of a developer’s finger, well-provided areas develop at pace while the previous poorer occupiers of those areas get relocated to the fringes. But my, those townhouses look splendiferous! Despite the fact that I have the town-planning nous of a toddler with Duplo bricks, thinking in unimaginative blocky grids, Anno 1800 never fails to evoke a sense of buzz and bustle. When I hover the camera just above building height to see kids rolling hula-hoops through streets, people getting married, and drunkards decking each other outside pubs while, in the distance, grain fields undulate and factory chimneys spew soot into the sky, I feel intoxicated by the atmosphere and proud of my work. Down at the harbour, ships systemically ferry goods between the different islands, and eventually tourists from faraway lands will pull in on cruise ships to peruse museums and zoos. Both these buildings can be expanded by embarking on expeditions in search of artefacts and animals. These odysseys carry their risks, and on your ship’s journey you’ll be faced with critical dialogue-based decisions that dictate the success of your mission. 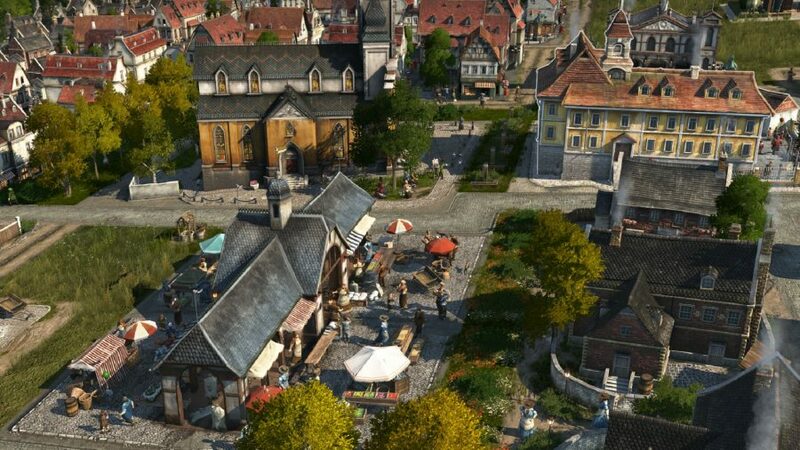 Anno 1800 is filled with these snippets of narrative flavour, which help break up a game that can sometimes feel a little too gentle and stable. 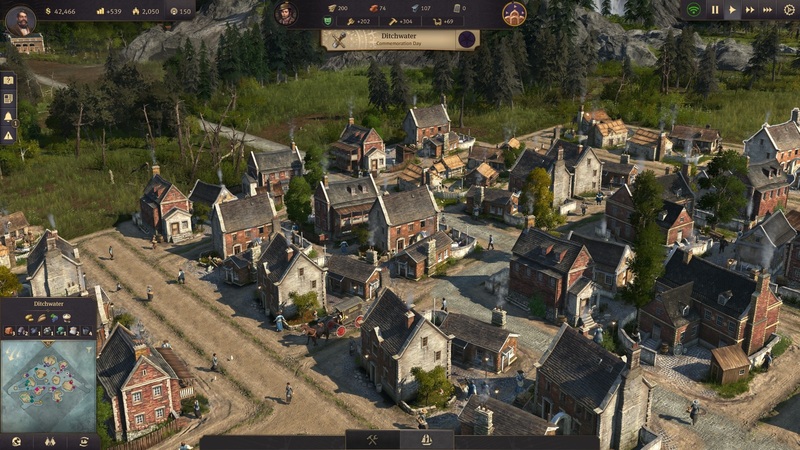 There is a lot to build in Anno 1800, so much that it could cause you to seize up in choice paralysis: endless farms and factories, theatres, pubs, churches, shipyards, fisheries, town halls, trade-bloody-unions, boxing arenas, railroads, and more. Every architectural symbol of the Victorian era is represented. Which is, of course, what you want from a city-builder: variety. But Anno 1800’s cities demand a lot of real estate for a game based around inherently cosy islands. Many production chains require three or four buildings, and you need to manually roll out vast fields for your farms. If you want your city to look like something more than a dull grid of pokey alley-roads overshadowed by tall buildings, then you should dedicate about three squares width to your roads, perhaps filling the middle one with trees. And plazas, manually designed by yourself of course, look the part, too. To that end, you can crank up working hours, increasing production at the cost of happiness, and risking strikes which have a nasty habit of spreading virus-like through your city. It’s a neat aspect to include, though rarely something you need to worry about unless you start to really take the piss with your workers. Then there’s the newspaper, which rolls around once in a while to report on events in your empire. If supplies of certain expected luxuries are running low, the press will report it and production will take a small hit empire-wide until the next edition. Or, if a factory burns down, your people will be that bit unhappier for having read about it. The twist is that you can use Influence points – otherwise spent on occasional boosts to trade, production, culture, or other areas you want to focus on – to manipulate the press, replacing the headlines with state propaganda that swings public opinion back your way. ‘I’ve seen the future, and I’ve seen Twitter’, I’d tell the people. ‘Freedom of speech is overrated’. When trying to record in-game footage using my trusty AMD screen recording shortcut, Ctrl+Shift+R, I discovered an easter egg that lets you wander around your city in first-person, complete with sprinting and jump buttons. Cute. To keep clocking up the funds, you’ll need to engage with your rivals. There’s a rudimentary diplomacy system where you can flatter, threaten, and carry out quests for them, but the bulk of your interactions will be through trade. It’s pretty hands-on, making you manually plot out trade routes and allocate the amount of resources you want to buy and sell. But it feels fiddly and opaque – and not as clever as it tries to be. The value of resources, how much money each route makes, and the effect it has on your resource numbers back at home isn’t readily clear, making the trade system a bit of a mystery. Lack of clarity is one of Anno 1800’s bugbears. I’ve set up trade routes that never delivered the desired resources – possibly due to assigning one ship to several routes, which I was never notified about. I’ve also witnessed with my own eyes, ladies and gentlemen, carts delivering sausages and beer to warehouses that never make it into the stockpile. Is there just an endless Oktoberfest going on in there and I’m not invited? Some German developer in-joke at my in-game expense? Another mystery I never quite figured out. Despite the occasional obscurity, your urban empire should tick steadily towards a glorious future – something that can be made more challenging by tweaking the panoply of pre-game settings. But a point of friction that these games are prone to, when all’s going well and you’ve built most of all there is to build, is that dreaded question: ‘Well, what next?’. You could go to war, carried out exclusively through naval bombardments of enemy ships and shores, but there’s not much tactical depth there to get embroiled in. The more likely option is to expand to new islands or, upon reaching the third tier of housing, set sail for the New World, where a new architectural style, soundtrack, civilians, and setting wait. But these surface changes in the New World fail to mask the fact that you’re going to go through exactly the same loops as in your previous settlements, but with fewer tiers to progress through and a Latino-colonial theme. Instead of delving deeper as the game goes on, Anno 1800 just spreads the same loops to islands of varying sizes, which isn’t terribly thrilling to me. The multi-session approach would’ve benefited from some asymmetry. The Old and New Worlds were two vastly different places after all, with the latter pretty much fuelling the former. There are no native AIs to encounter in the New World here, and so no dilemmas about the exploitative nature of the relationship between workers out in the colonies and the flourishing imperial hubs back home. These were the dying years of slavery too, particularly out in the tropical feeder territories, which could’ve been approached through some kind of interesting risk-reward procedure. Anno 1800 avoids these tougher topics entirely. Likewise, while the Old World pays lip service to workers’ rights and riots (and presents it beautifully), but there are no meaningful policies and decisions that these events rest upon other than long working hours and a lack of goods. 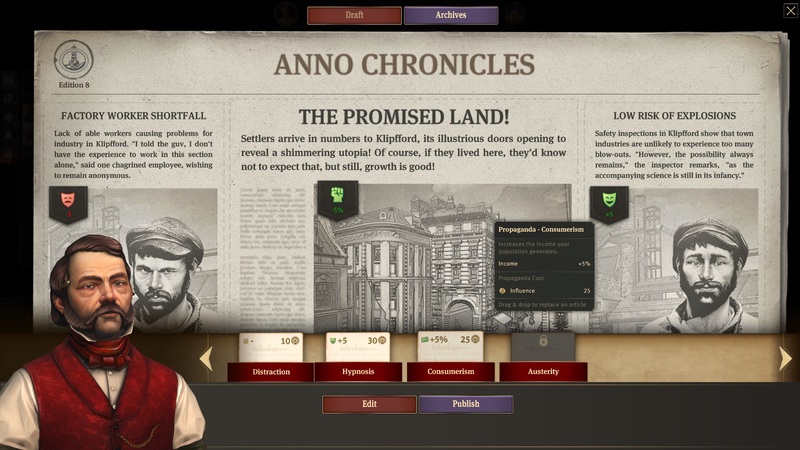 At a time when fellow city-builder Frostpunk layers the actual building part of the game with absorbing moral conundrums that force you to weigh up tough decisions, and even the light and breezy Tropico 6 pulls you into Cold War politics, Anno 1800 feels superficial. It’s a very fetching surface, mind, so those more interested in building a beautiful city than engaging in roleplay-like management may not mind those omissions. Sadly, being the management-driven bureaucrat that I am, I do mind.